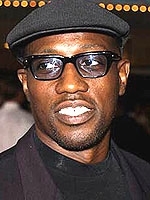 JUNE 8--Facing trial in a bizarre tax avoidance scheme, actor Wesley Snipes claims that prosecutors used race as a factor in deciding to charge him with failure to file six years worth of IRS returns. In a motion to dismiss an eight-count indictment filed last October, Snipes argues that he is the victim of selective prosecution. Snipes points to the fact that his two "Caucasian" codefendants, Douglas Rosile and Eddie Kahn, have not been charged with failure to file tax returns, though investigators are aware that Kahn did not file returns for six years and that it was "possible" Rosile did not file for two years. Snipes, who was hit with six felonies for failing to file between 1999-2004, contends that the half-dozen counts were "impermissibly brought on the basis of Mr. Snipes' race" and should be "dismissed based on selective prosecution." Snipes, Rosile, and Kahn have been accused of attempting to defraud the government by claiming that the actor was immune to taxation based on the "861 argument." That claim, which has long been rejected by IRS officials, referred to a section of the federal tax code.